William Filene established his famous Boston apparel store in 1881. This family-owned business prospered for many years, and eventually grew into the large Filene's department store chain. 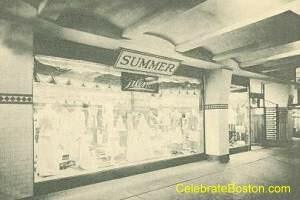 Filene's Basement, the discount outlet, began operating in the basement of the flagship downtown Boston store in 1909. 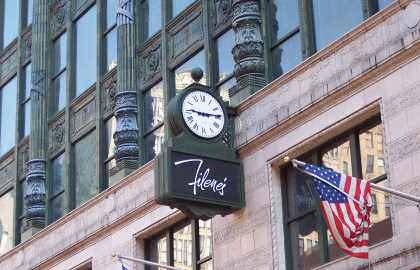 Filene's Basement can be considered the first modern off-price store in history. The original purpose of the basement outlet was to sell excess merchandise from the large department store above. The concept was so successful that manufacturers and other retailers soon began selling merchandise directly to the basement outlet. The Washington Street Tunnel (part of today's Orange Line) opened on December 1, 1908. A predecessor Filene's building was located at the south corner of Washington & Winter Streets. A Filene's entrance was built inside the new subway station that connected the department store directly with the transit system. The Filene's subway entrance was magnificent; with a beautiful illuminated stained-glass peacock's tail embedded in the floor. Above the glass floor was a mirrored ceiling, which created a gorgeous effect that was compared to a Tiffany lamp. "This new basement floor was opened yesterday as a big Christmas bazaar to accommodate the throngs of holiday shoppers and to make selection easy. Overflow Christmas departments have been established here together with booths containing miscellaneous articles of Filene dependable quality. There are booths filled with many things suitable for girls. The articles in one booth are all of one price, those in the next booth of another price, etc. When purchased, these articles are all put up in very attractive special green holiday boxes. The use of the as an overflow Christmas department is only a temporary use as Filene's have other plans for this portion of their establishment which will later be announced." According to a Filene's advertisement in the April 15, 1920 Boston Globe, the discount basement outlet had officially opened on January 9, 1909. It was initially called the Tunnel Bargain Basement. A revolutionary price discount system was implemented in the store, of which items were automatically marked down in price after specific periods of time. A novel incentive was also developed by William Filene's son, Edward. If a customer discovered a misrepresentation in any advertisement, sign, or tag, a $5 reward (as well as other prizes), was offered to the first person to report it. Such incentives guaranteed that the automatic mark-down system in the Bargain Basement would always be up-to-date. "Tunnel Bargain Basement. Come In From The Tunnel Trains — Winter St. Station. Filene's stands for new, successful, and daring methods in distribution of merchandise on a large scale at retail. And this Tunnel Bargain basement, with its Automatic Price Reductions week by week—among other extraordinary innovations—is the latest chapter in the story of Filene's Stores. The scientific distribution of the necessaries of life is good business. But when it reduces the cost of living in thousands of families, when it lessons or removes the drudgery of making clothes in the home by bringing down the cost of clothes ready to wear to a point where it is cheaper to buy than to make them, then the store that succeeds in doing this is also doing a large and genuine public service. And this is what Filene's Tunnel Bargain Basement is doing today. This announcement will tell you something about how we do it. A better Way is to find out yourself. Walk through the Tunnel Bargain Basement every day you are in town. Make it a habit to get out at the Winter Street Station of the Tunnel and come through the Filene's Tunnel Entrance on the way to other engagements. Just walk through Filene's—and see." On September 3, 1912, Filene's moved across the street to the famous 426 Washington Street building. The basement outlet then became known as the Automatic Bargain Basement. The photograph above is of an attractive display window of the 426 Washington Street building in the subway station below the store. In 2005, the Filene's department store chain was absorbed into Macy's, and Filene's Basement is an independent retail chain.